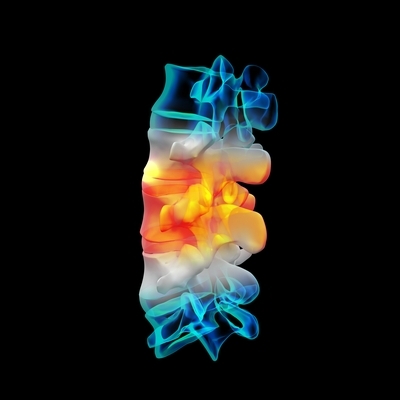 Healthy intervertebral discs are the spacers and shock absorbers that are positioned between each of the vertebrae in our spinal column. When our total energy is low or we feel unsupported emotionally, holistic practitioners have observed that is the time when we are most likely to have a type of collapse of the normal support of our spinal muscles and ligaments, and then injury to the discs occurs. The most common type of protrusion (or herniation) is backwards into the spinal canal where the disc can compress a spinal nerve centrally or on either side (Fig 1.) Depending on where the compression is determines the nerve involvement that will cause back pain. The entire disc can also slide forward, and an outstanding technique has been developed in the last decade to rather painlessly adjust the disc from the abdominal approach to restore it to normal position. The compression or bulging of lumbar discs causes pressure and sometimes even pinching on the nerves that run through the spinal cord. This creates the pain that individuals with herniated discs often experience. Acute disc herniation requires special management and the use of so-called “non-force” chiropractic techniques such as the sacro-occipital technique using pelvic blocks to reposition the pelvis and reduce pressure on the herniated disc. Movement has to be restricted and undertaken carefully. Occasionally bed rest is needed in the most serious cases. Proper chiropractic care can be astonishingly effective in reducing disc herniation. Over-the-counter anti-inflammatory meds and special high potency enzymes are often recommended to reduce swelling along with special dietary guidance. Once the acute pain is gone then it is important to test all the muscles in the anterior abdominal compartment for normal strength, for they are fundamentally important in supporting the spine. As balance to the spinal muscles is achieved through application of all the techniques available in applied kinesiology, the normal spinal curve is regained and side bending posture leaves (See figure 2.) Chiropractic rehabilitation is generally much faster than other forms of mainstream medical management and physiotherapy.